Samford University’s Orlean Bullard Beeson School of Education recently hosted a poverty simulation for education students to help prepare them for working with children and families from all populations upon student teaching and graduation. The simulation was sponsored by the School of Education’s Diversity Committee. Michele Haralson, director of curriculum materials and technology center and chair of the committee, explained the purpose of the event was to prepare education student to meet the needs of all learners. 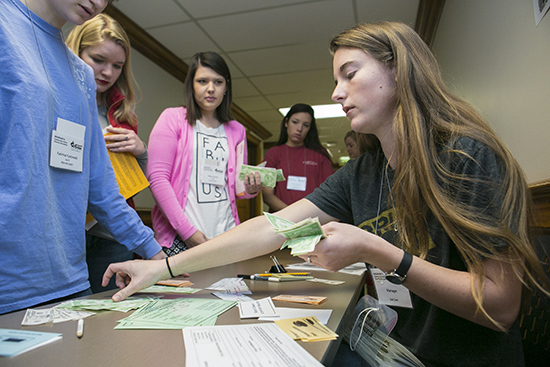 The simulation included junior and senior leadership teams serving as community workers, while the remaining students played the roles of members of families living in poverty. The activity included several different family makeups living through a month of poverty, which consisted of four 15-minute weeks in the simulation. During the week, the students experienced what it is like for those in poverty to put their children in school and daycare, pay bills, feed their families and get from one place to the other without personal transportation. Haralson said the participating students completed pre- and post-surveys in order to gather information on the effectiveness of the event.